Edmund Horace Fellowes CH MVO, clergyman, musical scholar and historian, served as Minor Canon of Windsor for over fifty years, from 1900 to his death in 1951, the only Minor Canon to have served in that office under five Sovereigns. A devout Anglican and advocate of traditional church music, he was best known outside Windsor as an eminent musicologist who championed the revival of sixteenth and seventeenth century English music. Within St George’s Chapel, he was additionally renowned for his high principles, his practical musicianship and his dogged devotion to duty. Born in Paddington, London, on 11 November 1870, Fellowes demonstrated early musical talent and in 1878 Joseph Joachim offered to take him to Berlin to train him as a professional violinist. Instead, Fellowes decided to undertake a more conventional education and to pursue a career in the Anglican Church. 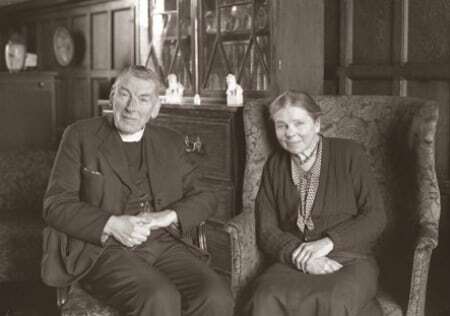 He studied at Oriel College, Oxford, graduating with a degree in theology in 1892, and was ordained deacon in 1894 and priest in 1895. However, he continued to pursue his interest in music, becoming a highly talented performer and in 1896 obtained a Bachelor’s degree in Music from Oxford University, before taking up the post of Precentor of Bristol Cathedral in 1897. Three years later, in 1900, he came to Windsor with his wife, Lilian Louisa, and moved in with his furniture to number 5 Canons’ Cloister. Complaining on arrival to Chapter about the lack of a bathroom in their accommodation, he found out shortly afterwards that none of the Canons or Minor Canons enjoyed this luxury. As his son, William, explained in his article, ‘A Childhood in The Cloisters’, at this time ‘only the Dean had one [a bathroom] but he did not use it because the only access was through the kitchen’. Even when Fellowes moved, in 1908, to larger premises further down the hill at number 23, living conditions were far from satisfactory. There was a bathroom, but it was situated in the basement, there were no fire escape arrangements and there was no electricity supply. However, having made a number of improvements (although the introduction of electricity would not take place until 1952, the year after his death), Fellowes, his wife and growing family – three sons and one daughter – enjoyed living in the timber-framed house, reputedly occupied by the famous organist John Marbeck, for many years. This photograph (SGC PH POR.41a) shows Fellowes and his wife seated in one of the historic rooms. Edmund Fellowes’ musical talents were to prove invaluable to the Dean and Canons of Windsor, not just in ‘his rendering of the priest’s part in the services’, which according to his biographer Dr Watkin Shaw ‘was of exceptional dignity and beauty’, but also in his direction of the choir. On the death of the renowned Organist Sir Walter Parratt, on 27 March 1924, and simultaneous resignation of the Assistant Organist, Martin Akerman, on health grounds, Chapter invited Dr Fellowes ‘to act during the vacancy as Choir Master, to take charge of the weekly rehearsals of the full choir, and also to compile the weekly music lists’. It was a significant undertaking, particularly when it turned out that Parratt’s chosen successor, Sir Henry Walford Davies, would not be available to take up the post of Organist and Choir Master until three years later, in 1927. However, a distinguished music scholar and a committed practical musician, Fellowes willingly embraced the position and, although not an organist himself, he was able to draw on the services of Malcolm Boyle, a former chorister and organ pupil of Sir Walter Parratt, to accompany the choir. As Choir Master, he took the Lay Clerks on a joint visit to Canada with Sydney Nicholson and boys from Westminster Abbey, an ambitious venture which proved a great success. A further vacancy in the position of Organist and Choir Master, between November 1932 and March 1933, saw a resumption by Fellowes of his musical duties and, in a Chapter Act of 25 March that year, the Dean and Canons acknowledged with gratitude ‘the time and care he has voluntarily given at the full rehearsals of the Choir and to the preparation of the music for the Choral Services’. However it is for his work as a musicologist that Edmund Fellowes will be best remembered. During his tenure at Windsor, he undertook major research on sixteenth and seventeenth century English music, both sacred and secular, and edited for publication an impressive number of Tudor works, including thirty-six volumes of madrigals, thirty-two volumes of lute songs, and twenty volumes of William Byrd’s music. Fellowes’ other publications included William Byrd (1923), The English Madrigal School(1924) and Orlando Gibbons (1925), and he acted as one of four editors of the ten volume series of Tudor Church Music, published in 1929. His major individual contribution to the study of Anglican Church music, English Cathedral Music, was published in 1941 and remains the standard work on the subject. However, Fellowes did not confine his research to music. His interest in genealogy and local history led him to play a major part in the production of the St George’s Historical Monograph series, to which he contributed five volumes. Although he never achieved a Canonry as he hoped, he was created a Companion of Honour in 1944 in recognition of his outstanding services to musicology and Windsor history. Other honours received during his lifetime included appointment as MVO, honorary doctorates in music from Dublin (1917), Oxford (1939), and Cambridge (1950), and an honorary fellowship of Oriel (1937). He died on 21 December 1951 in a nursing home, having resided for over forty years in number 23 The Cloisters. In 1954 the house was renamed ‘Marbecke’ or ‘Marbeck’ in tribute to an earlier Organist and Choir Master, erroneously believed to have occupied it. Perhaps it should have been named ‘Fellowes’.